View More In Car Chargers. One hand operation, it can be easily installed or removed on an air vent securely by clamping, Silicne cushions on clip protect against slips and scratches. Just put the phone down to the mount then it will hold it stable, the size range is from 4.0'' to 5.5'', optimized spring in the clip insure the stale hold during driving, no need to worry the safety! The wireless car mount charger combines charger and phone holder function, needing no cords and cables. Much convenience you will enjoy when you are driving. The Fast Wireless Car Charger adopts high charging efficiency upgraded independent coil, faster charging your phone. Charging in quick speed with up to 10w power. The Air Vent Mount is much easier for you to reach the phone in the car and keep your phone standing stably. Moreover, The Car Air Conditioner Can Cool The Charger Down In Summer To Avoid High Temperature Affect Charging Speed. 10W QUICK CHARGE: Charge your phone in a fast speed, the car charger help you get rid of the wire manacle and charge your phone efficiently. And there is a LED lamp with electric prompt. 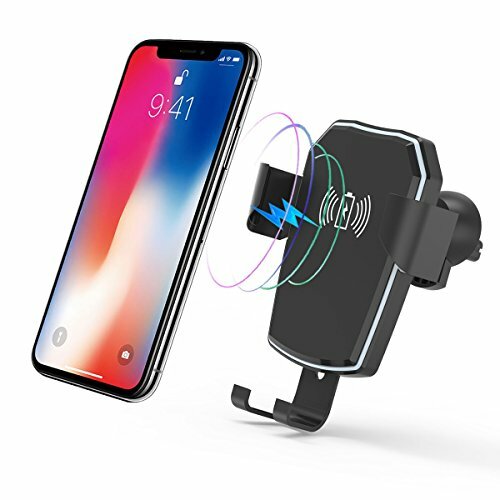 SAFE AND STABLE: This car phone holder using soft rubber mats to added on the vent clamp, provide you with slip-proof and shock-proof, protect the air vent of your car and cell phone from damaging. 360-DEGREE ROTATION: The mount's flexible 360-degree rotation allows you to switch your phone at a comfortable viewing position. The device ensures that you will always get the optimal viewing angle whether you're making calls, navigating, or listening to music, this thoughtful design helps keep your attention on the road. CONVENIENT PHONE HOLDER FOR CAR: Vent attachment is designed with elastic clip and push-on buckle, hold your phone in place more definitely. No longer worry about the devices slipped off the air vent. SAFETY PROTECTION: Protect you cell phone when it is charged. The car charger provides overvoltage protection, temperature protection, short circuit protection, and overcharge protection. If you have any questions about this product by Cornmi, contact us by completing and submitting the form below. If you are looking for a specif part number, please include it with your message. Conversion Van Cover, Class B RV Cover. Fit Standard Wheelbase, 226" Long 86" High top van.